Manchester Art Gallery asked for the Art Detectives’ help concerning a painting of a ‘Cottage in a Cornfield’, formerly attributed to John Constable. Lynette Domoney put together a full and fascinating document (attached to the discussion), positing the view to be of Lavenham in Suffolk. In addition, Lynette found a few clues to indicate Constable had a connection to the area – however a Constable specialist at Tate deemed the work as not by the artist in 2006. Tim Williams discovered that the work was not by Constable, but by Thomas Francis Wainewright. There are records of the painting being withdrawn from the 1873 Royal Academy exhibition, as Wainewright spotted it being exhibited as a Constable, and thought it 'only right to state' that he painted the work in 1853, which depicts a view near Starcross, Devon. The Saturday Review of Feb 8th 1873 dismisses the mistake as 'laughable'. Sarah Cove, Accredited Paintings Conservator and Founder of the The Constable Research Project contributed her thoughts: the work is most definitely not by Constable. The mystery remained as to the exact location of Wainewright’s view. The Starcross area was probably familiar territory for the artist, yet there was debate as to the purpose of the background building. Could the building in the background could be a windmill rather than a church? Is there also a body of water depicted, or just a sloping field? 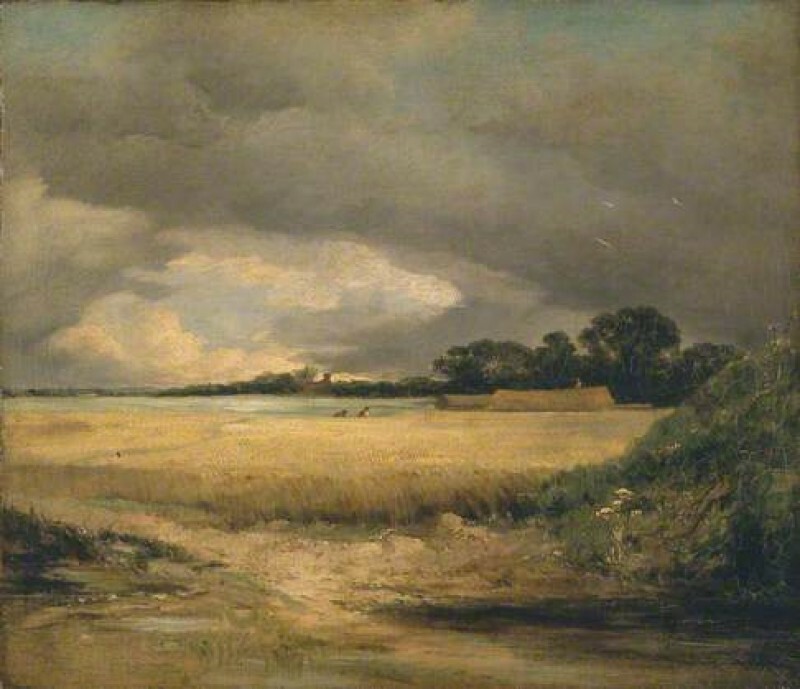 In any case, the colleciton were happy that the work could be retitled Landscape with Cornfield and confidently listed as painted in 1853 by Thomas Francis Wainewright (c.1815–1887).